Due to recent controversy over Chippie The RFID’s nationwide educational seminar school tour, Chippie and his legal representatives held a press conference to clear the air in regards to a number of distasteful allegations that have recently been thrown at Chippie and his camp. Chippie is currently halfway into the tour which has seem some heated opposition in certain states. On the 11th of November, when arriving to their scheduled appearance at Tartarus Middle School in Olympian Village, MO Chippie and company were faced with throngs of enraged and confrontational protesters surrounding the school. Despite the presence of such intense hostile resistance, everyone managed to make it into the school to carry on with the regularly scheduled presentation. The audience was much smaller than previous appearances but the crew intended to give 110% regardless the turnout. The show was cut short however when a woman in the audience began reciting bible verses at the top of her lungs and accusing Chippie of being The Mark Of The Beast. This caused several children in the audience to break into hysterics and the show had to be canceled. To drive the point home, Chippies assistance rolled out a new campaign slogan to quell the fears of the old-fashioned and religious. 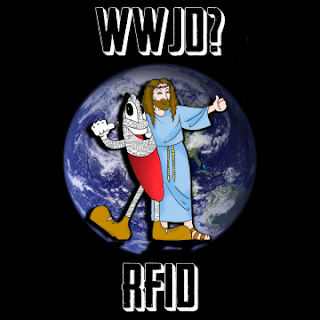 In it (pictured above) Chippie can be seen arm in arm with Jesus Christ with the words “WWJD: RFID” featured prominently on the image. Will this tactic prove for smooth sailing during throughout the latter half of Chippie’s tour? I suppose only time and the notions of the superstitious Christian minority will predict how the situation will eventually pan out.